Your hair is an important part of you. It has a sensory function that extends the sense of touch to various parts of the body such as the nose and ears. The roots of your hair are referred to as hair follicles. Hair follicles contain a chemical compound referred to as melanin, which is responsible for hair pigmentation. As you grow older, the amount of melanin decreases, leading to loss of hair pigmentation. This is why your hair turns gray as you grow older. This is a perfectly normal occurrence. However, there are cases where a child has white hair. This is a harmless condition referred to as Canities. While it is not a medical emergency, this condition can affect a child psychologically, especially if they are uneasy about having white hair. So, what causes Canites? Let’s explore some of the reasons for white hair in kids. What Causes White Hair in Children? 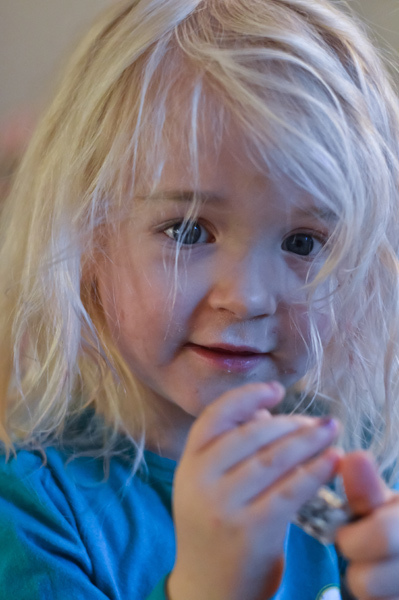 More often than not, the reason your child has white hair is down to genetics. The child might be predisposed to premature maturational schedule. Besides, research has shown that there’s a correlation between white hair and dandruff. While one doesn’t cause the other, there is a likelihood that you might get white hair if you have lots of dandruff. Generally, Caucasians are more prone to getting white hair than other races. If you have a family history of early onset of white hair, then there is a high probability of white hair in child in your family. Skin disorders such as tuberous sclerosis, vitiligo, neurofibromatosis and Waardenburg syndrome can lead to the loss of hair pigmentation. If this is the reason for your child’s white hair, they will exhibit other symptoms including hearing loss and seizures. Thyroid disorders can also cause early graying of hair. There is a possibility that your child is suffering from a vitamin B12 deficiency if they start to gray prematurely. Most animal food products contain vitamin B12, so deficiency is unlikely unless your child is on a strictly vegan diet. It can also happen if the child has had stomach surgery that has made it impossible to absorb adequate amounts of vitamin B12. If you suspect vitamin B12 deficiency, you should consider supplementing your child’s diet with vitamin B12. There is a popular misconception that stress causes white hair. There’s no scientific research to back this up. However, research has shown that genotoxic stress on the genes can cause mutation of the hair cell. Genotoxic stress occurs as a result of radiation and ultraviolet light. Coconut oil helps moisturize the hair and stimulate hair growth. Amla is rich in antioxidants and vitamin C. Both of these help reverse the loss of hair pigmentation in children. Blend some Amla (also known as gooseberries) in coconut oil. Once they turn black, you can turn off the heat and let them cool. Store the mixture in a glass bottle. Apply the mixture on your child’s hair and scalp. Do this twice a week. You can get rid of white hair in your child by massaging their scalp with a mixture of almond oil and amla juice. Almond oil contains lots of vitamin E which helps reverse the premature graying of hair. For best results, apply on a daily basis. Curry leaves can help restore the natural color of your child’s hair. When you boil curry leaves in coconut oil, it forms the perfect hair tonic to bring back the original hair pigmentation and stimulate growth. Apply the mixture on your child’s scalp in the evening and leave it on overnight. Massage some cow milk butter onto your child’s scalp and let it sit for about an hour. Rinse it off with water, making sure to get it all out since it can get greasy. Butter from cow milk contains enzymes to keep your hair well-nourished and prevents the black hair pigment from disappearing. For best results, repeat this process at least twice per week. To prevent or get rid of white hair in child, make sure they are getting adequate amounts of vitamin B in the diet. In particular, biotin (vitamin B7) and folic acid (vitamin B9) are needed in the production of blood cells, which help with transportation of nutrients to the scalp and hair follicles. Vitamin B2 helps increase the production of melanin in the body, which plays a key role in the pigmentation of hair. Ensure your child’s diet includes dairy products, cereals, turkey, chicken, eggs, meat, whole grain bread and vegetables. Vitamin A is necessary for hair and scalp health. Some great sources of vitamin A include yellow fruits, dark green vegetables, broccoli, turnip greens, liver, butter, milk and eggs. You should make sure to include foods rich in minerals such as iron, zinc and copper. You can find iron in dried apricots, beef, parsley, wheat, sunflower seeds and eggs. Red meat, green vegetables and chicken are a rich source of zinc. For copper, ensure your child’s diet contain foods such as whole grains, egg yolk, cashew nuts, sunflower seeds, almonds, lentils and spinach. It is important for your child to get adequate amounts of iodine in their diet for proper hair growth. Some great sources of iodine include carrots, bananas, egg yolks, onions and fish. Protein is required during the production of melanin. Therefore, it is important to include rich sources of protein in your child’s diet. Some rich sources of protein include soy, cereals, eggs, chicken and turkey. Add a tablespoon of yeast to yogurt and give some to your child every day. This combination is a great way to treat premature graying.